Aid to Egypt: What’s the Rush? 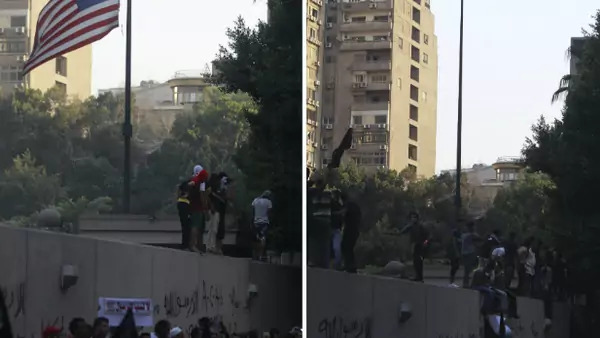 A combination picture shows protesters shouting slogans before (L) and after pulling down an American flag in front of the U.S...oduced in the United States that was insulting to the Prophet Mohammad, witnesses said. (Courtesy REUTERS/Amr Abdallah Dalsh). Texas Rep. Kay Granger has put a hold on $450 million in aid to Egypt, and this has caused consternation in the Obama administration. This proposal comes to Congress at a point when the U.S. - Egypt relationship has never been under more scrutiny, and rightly so. I am not convinced of the urgent need for this assistance and I cannot support it at this time. As Chair of the Subcommittee, I have placed a hold on these funds. As the president made clear more than a year ago when he pledged a billion dollars in support from the American people to the people of Egypt if their transition stays on track and continues, and as the secretary said when we were in Cairo in July, on Friday we here at the State Department notified the Congress of our intention to disburse $450 million in budget support to the government of Egypt in two tranches,” she said. Thereafter, we had some interest in that from the Congress, so we are obviously going to have to work with the Congress in the coming days and weeks to explain why we think this money is so essential at a time of almost $12 billion in budget gap in Egypt, why we think supporting the democratic trajectory of Egypt in a phased way is in U.S. interests, because we obviously firmly do. Granger is right—not to block aid to Egypt forever, but to wonder why we must rush forward right now. To begin with, Egypt’s “democratic trajectory” under its new Muslim Brotherhood government is no sure thing. Consider this August statement from the Committee to Protect Journalists and entitled "Egyptian Government Attempts To Suppress The Media:"
President Mohamed Morsi’s government and allies are pushing back against critical news coverage, suppressing critical journalists and state-run newspapers, putting a journalist on trial, and attacking three journalists on the street, according to news reports. "This is a troubling backward step that Egypt’s newly elected President Mohamed Morsi should not be taking," said CPJ Deputy Director Robert Mahoney. "We urge President Morsi to reverse this course immediately and demonstrate his commitment to press freedom." Moving forward with all the aid requested can be seen as simply dismissing such concerns and sending a message that they do not trouble us. Then there is the Morsi response when a mob attacked the U.S. Embassy in Cairo. Egypt is not Libya, where one can really question the ability of the police and military to keep order. The security forces in Egypt are strong enough, but were never told to act. On September 11 a crowd of about 2,000 was permitted to reach the walls of the U.S. Embassy and scale them, and tear down the American flag. Others circulated within the compound for hours, and we are lucky none of them harmed American personnel. This assault should never have been permitted, and Morsi has yet to offer a real apology for failing to protect our facility—the kind of full and sincere apology the Libyans have offered. Finally, why now? Egypt has apparently been in no great rush to conclude its agreement with the IMF. Moreover, where’s $450 million in cash from each of Egypt’s friends in the Gulf? For the most part, Gulf Arab oil producers have made deposits at the Egyptian central bank—but the money is supposed to stay there, not be spent. If we are serious about bailing out the Morsi government, why just hand money to Egypt instead of seeking some kind of agreement from other donors that they too will lend a hand? Why not demand that they match, or double, what we contribute? So much for freedom of speech as we understand it. Rep. Granger did not say she thought Egypt was an enemy, or a lost cause; she said she cannot support the assistance “at this time.” That suspension of judgment seems wiser than a rush to embrace the new government of Egypt. Who Will Speak Up for Lebanon?